As global regulations for Product Serialization and ePedigree increase, many Life Sciences organizations are discovering that their legacy solutions are not configured to support new regulatory requirements (EU FMD, US DSCSA). Next generation Track and Trace solutions are quickly evolving into a seamless network of integrated systems that include the ERP, Event Repository, Serialization Management, Packaging Line Technology, Material Movement, and Business Process Controls. In addition, external partners, such as Third Party Logistics providers (3PLs), Contract Manufacturers/ Packaging and Distributors / Wholesalers/ Retailers, must also be integrated seamlessly into the network to maintain control of serialization and chain of custody. Life Sciences organizations also need to conform to new standards set by GS1 & HDMA in terms of event recording, global trade item numbers (GTIN), bar-code requirements (GS1 128, Datamatrix 2-D) and the new labeling requirements at unit, case pack, and pallet levels. 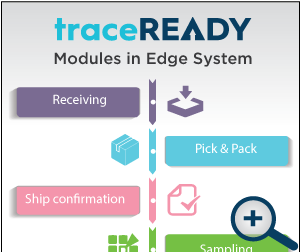 Why traceREADY Warehouse Edge System? The current global regulations mandates recording of all business events in a centralized repository for enabling Track and Trace for supply chain security. This requires product serialization, aggregate packaging, and maintenance of business events in a centralized repository. Any changes to packaging in terms of aggregate and disaggregate need to be collected and stored. In order ensure accurate and timely data from the packaging line, it is necessary to have an application to collect the required data and transfer the same to the central repository. How can Navitas Life Sciences help? traceREADY Warehouse Edge system have been helping companies in regulated industries, such as Biomedical and Pharmaceutical manufacturers, to maintain compliance with DSCSA regulations. traceREADY’s experience with data collection enables companies to ensure accountability and preserve a clear audit trail across systems and processes. All business events captured using Electronic Product Code Information Services (EPCIS) format to ensure universal access to the what, when, where, and why information. We have solutions that fit your needs whether you’re a Manufacturer, CMO, 3PL, or distributor. Process and System Integration. We have extensive process expertise and can demonstrate proven integration success with SAP, Manhattan, Oracle, JDE, and other systems. One company. One solution. One decision. One project. ......FASTER GO LIVE! Navitas offers a full suite implementation service that combines the EPCIS Repository for Track and Trace implementation, licenses and Warehouse Edge Implementation and licenses into a single offering. This streamlines the decision process, simplifies communication and project management, optimizes timelines and ensures that all system requirements are met and validated by a single, expert team. Reduced Total Cost of Ownership. Talk to us about bundled Track & Trace solutions that provide you with the highest ROI available, but we can also align ourselves with your current Track & Trace and Line Management Vendors.